This trail follows the north bank of the Phophonyane River with spectacular views over the Phophonyane Cascades and Potholes has several options (1) down the big steps to the bottom of the waterfalls to join Trail 3 and viewpoint D; (2) join the loop to Trail 3 will give you a spectacular view over the cascades and to viewpoint G; (3) pass the big steps onto viewpoint B (not for children! ), viewpoint C with a view over the cascades and pot-holes and to viewpoint J (Otter Pool) with a great view up the Phophonyane River Cascades; (4) along the fence line with a view onto the neighbouring homesteads or (5) through the small forest. The longest option is about 1.5 hours. The big steps are strenuous and the left hand path to join the loop to trail 3 involves a bit of clambering. This should be avoided in wet weather. Trail 2 is the longest trail taking you along the rugged Python Cliffs and the Riverine Forest of the Mbevane Stream. The upper loop takes you onto the eastern Cliffs, with a great view (Viewpoint I) over the Mbevane Forest. A good place for bird sounds. The Python Cliffs are a little steep and involve some clambering. These can be avoided by taking the link path between Trail 2 and 3. Time: 2.5 -3 hours. Trail 3 is relatively short and gives you spectacular views of the Waterfalls through a series of loops. Time: 1.5 hours. This is the nearest viewpoint, over- looking the waterfalls from the deck or viewpoint below the rock pool. This is where most accidents (some fatal) happen. Make sure you stay on the deck or designated area. It is highly likely that you will slip if you walk on the rocks over the waterfalls. This has a great view over the Gorge but requires special caution as there are no protective railings. 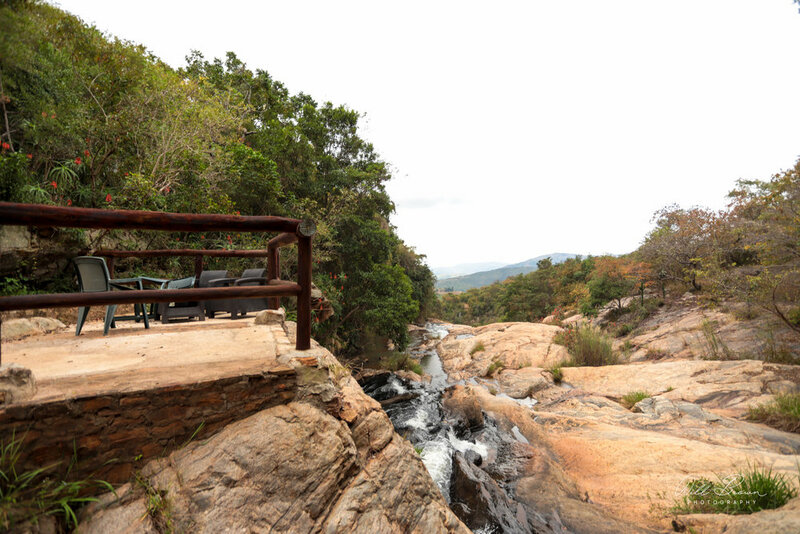 A good view and rest point with a bench overlooking the waterfalls and the Ntfonjeni Valley. An open clearing with a spectacular view over the Gobolondlo Mountain Range and the Ntfonjeni Valley. This trail adjoins Trail 2 and takes you to viewpoint F. This is the easiest walk! Time 1-1.5 hours. 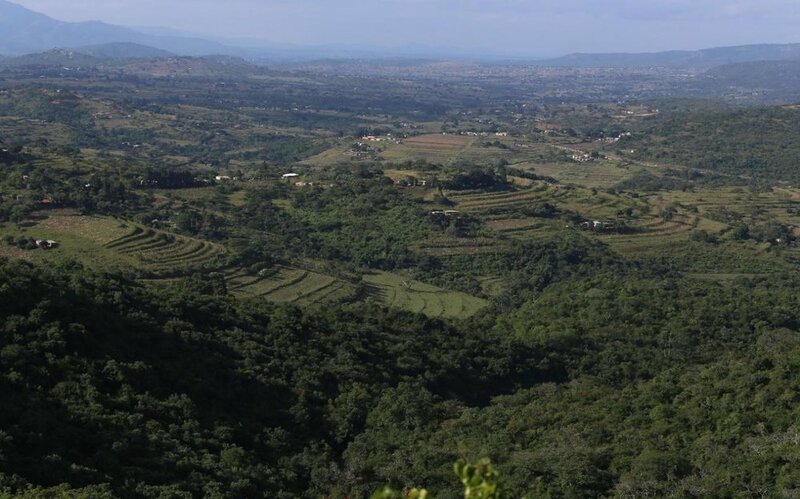 Good view over the Mbevane Forest and Ntfonjeni Valley. This offers a great view of the Phophonyane Cascades from the bottom looking upwards. TIPS on viewing wildlife in the Reserve. There is a fair amount of small game in the nature reserve and the most commonly seen animals are red duiker and bushbuck. However, these animals are shy and will only be seen if approached silently. Otherwise you may only hear the sharp whistle of the red duiker or the harsh bark of the bushbuck as they call in alarm and disappear! Birdwatching is best in the early morning on the trails. Alternatively, an early morning or late afternoon walk up the entrance road can be rewarding. This trip is a treasure trove for the landscape photographer and landscape artists, with views extending down to the lowveld where the Mnjoli and Sand River Dams glimmer in the distance against the Lubombo Range in the background. To the north the Ntfonjeni valley sprawls beneath you displaying Swazi homestead life and across the border to South Africa Lake Matsamo soothes the eye. The geologically inclined will marvel at the lichen covered rock formations. Maximum number of people per trip is 4. Rates include drive, guide and soft drinks or mineral water. *Please Note: Phophonyane Lodge Management and, or any of their staff are not responsible for any injury occurring to any persons partaking in this trip. Have an opportunity to interact with the local Swazi people and visit the local Primary School in the village. This trip gives insight of Swazi lifestyle and culture. The fee for the walk is a contribution towards community projects. These awe inspiring rock paintings are located in one of the hills in the Nsangwini area. Overlooking the Maguga dam and the lower Komati River. Amazing scenery graces this historic site.With a single exception, the rock art of Swaziland belongs to the Bushman tradition of expressing cultural beliefs and rituals as paintings on the walls of rock shelters and, occasionally, on free standing rock faces. They also engraved on stone, but their engravings are usually found in the western drier parts of southern Africa, and none have so far been recorded in Swaziland. The spectacular “birdmen” painting especially provokes the mind, as one wonders whether this was the portrayal of the spiritual component of life in the Nsangwini Rock Shelter. Through human beings quest for lucid detail these paintings have been recently outlined but still remain a prehistoric artistic display of an ancient way of life written on the rock by our fore runners. The site is normally accessible by ordinary vehicle. Note that conditions can get a bit rough in places and especially after rain. A local guide will take you on the slightly steep and rocky walk (15 minutes down; 20 minutes up) and will give a brief explanation. R375.00 per person sharing minimum charge R1050.00. Maximum number of people per trip is 40 .Rates include drive, guide, snacks, soft drinks or mineral water and a visit to local art and craft shops.